Kendrick Lamar performed on Saturday Night Live over the weekend. The west coast rapper paid homage to Method Man during his eye catching performance. Kendrick performed his song “I” with black eye contacts and his cornrows half done on his head which made many wonder why he chose to go with that look. Kendrick used his performance to pay homage to Method Man’s debut solo album Tical. November 15th was actually the 20th anniversary of the Wu-tang Clan member’s LP. 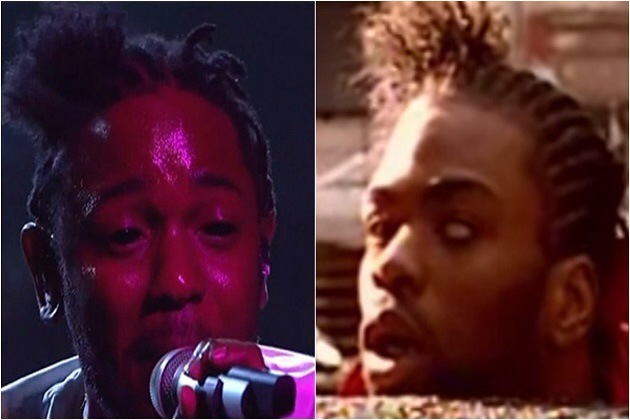 Kendrick’s hair was a representation of Method Man’s look in You’re All I Need To Get By featuring Mary J. Bilge. Long live real Hip-Hop! Watch the performance below! Previous Post#McFactz: #Migos Get ROBBED!Next Post#McFactz: #JCole Announces New Album!